How often do you see such mirror-like reflections in a blade? Nic Westermann is now recognised among green woodworkers as one of the best makers of quality carving tools. His customer base ranges from top-end hand tool suppliers, such as Lie-Nielsen, right through to novice woodworkers who recognise that buying quality tools from the outset is a good investment in the future of their craft. I was introduced to Nic a few years ago and since getting to know him, I have been buying and using his carving tools almost exclusively for spoon and bowl carving. 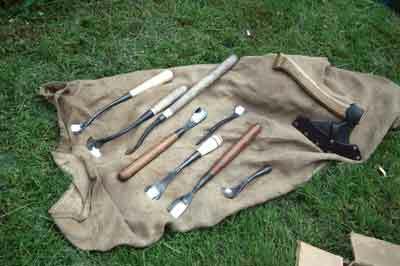 He produces a comprehensive range of knives and gouges on a regular basis and occasionally makes batches of axes and adzes. 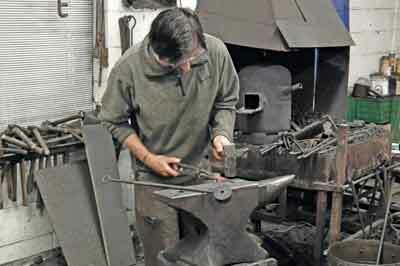 He also offers bespoke courses so you can spend time in the forge making your own unique tools. 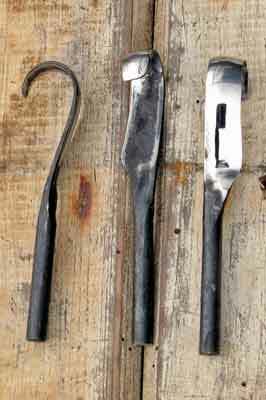 Nic started out as a self-taught artist blacksmith producing mostly decorative work requiring special tools which he made to suit. He moved over into making carving tools after taking an interest in green woodworking and deciding to make his own tools for the job. As such, his skills to both make and use the tools has evolved hand in hand. Having experimented with numerous steels, heat treatments and grinds and gaining feedback from professional users over the years, he is now producing tools that are an absolute joy to use, aesthetically pleasing and represent very good value for money. 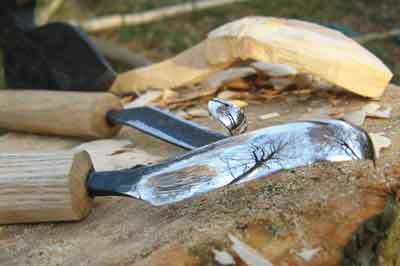 A range of blades are available through his website or at various wood shows throughout the year. Having had the benefit of working with Nic and using his blades for the last few years, I can honestly say that they are hard to beat. All of Nic's blades are supplied honed and polished into scary sharp territory; all you need to do is add a suitable handle and many hours of happy carving will ensue. Due to popularity stock levels vary so if necessary be patient - it'll be worth the wait!